Sea Grant is a Federal-University partnership program that brings science together with communities for solutions that work. The National Sea Grant College program was established by the U.S. Congress in 1966 and works to create and maintain a healthy coastal environment and economy. 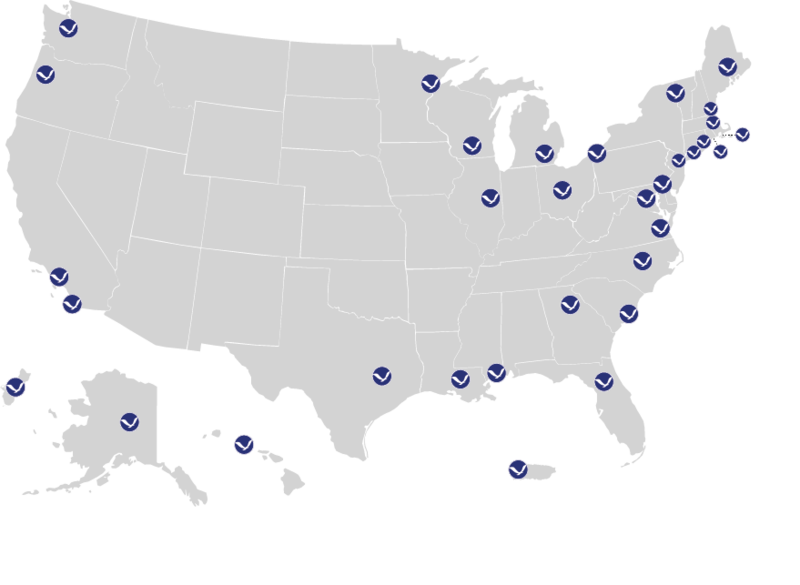 The Sea Grant network consists of a federal/university partnership between the National Oceanic and Atmospheric Administration (NOAA) and 33 university-based programs in every coastal and Great Lakes state, Puerto Rico, and Guam. The network draws on the expertise of more than 3,000 scientists, engineers, public outreach experts, educators and students to help citizens better understand, conserve and utilize America's coastal resources. Sea Grant is a national network of 33 university-based programs, the National Sea Grant Law Center and the National Sea Grant Library. Sea Grant recognizes the value in identifying and prioritizing needs on a regional level as a cornerstone of sound ocean, coastal and Great Lakes ecosystem management. Sea Grant continues to solidify its regional partnerships with each of the eight NOAA regions, bringing together academic institutions, federal, state and local government agencies, and non‐governmental organizations to address regional issues. Every four years, the National Sea Grant College Program taps into its vast network of scientists, engagement professionals, stakeholders, and federal partners to identify and address the needs of coastal communities around the country. A strategic plan is developed by representatives from the Sea Grant Network to produce high quality science and inform management of coastal resources in ways that balance human use with environmental health. The strategic planning process identifies core values and focus areas that drive efforts to address the priorities established by coastal communities. The idea of a Sea Grant College Program was originally suggested by oceanographer, inventor and writer, Dr. Athelstan Spilhaus at the 93rd meeting of the American Fisheries Society in 1963. Interest in the Sea Grant concept grew after the release of an editorial written by Spilhaus that appeared in a 1964 issue of Science: " I have suggested the establishment of ‘sea-grant colleges' in existing universities that wish to develop oceanic work...These would be modernized parallels of the great developments in agriculture and the mechanic arts which were occasioned by the Land-Grant Act of about a hundred years ago...Establishment of the land-grant colleges was one of the best investments this nation ever made. That same kind of imagination and foresight should be applied to exploitation of the sea." In 1965, Senator Claiborne Pell of Rhode Island introduced legislation to establish Sea Grant colleges on campuses nationwide as centers of excellence in marine and coastal studies. With the adoption in 1966 of the National Sea Grant College Act, Congress established an academic/industry/government partnership that would advance the nation's education, economy, and environment into the 21st century.